While watching IRON MAN 2, I felt like I should have taken notes in order to keep track of the plot. Robert Downey, Jr. is back as Tony Stark, multi-billionaire industrialist and super hero. Stark, while wearing the Iron Man armor has attempted to initiate world peace, and now the US government wants the armor to use as a military weapon. Meanwhile, a mysterious Russian plans on using the Iron Man technology against Stark. The movie also manages to tie in other characters including spies, a competing arms dealer, characters from the first movie, and Nick Fury. Yeah, there’s a lot here, and I had a hard time following it. The worst comic book movies are the ones that try to do too much. Multiple villains who have different agendas and long origin stories. Several plots that don’t tie together tightly. Catching up with characters from previous movies, while introducing the viewer to new ones at the same time. IRON MAN 2 has all of these characteristics. It’s uneven and jumps from plot point to plot point without reason. However, I found the movie a lot of fun, mostly because of Downey. His aloof, sarcastic characterization of Stark really drives the movie. He gets some great lines in, and makes sure the audience doesn’t try to take the film too seriously. He makes Stark feel like a real person, therefore the audience is willing to follow him wherever the film goes, no matter how ridiculous. The action is terrific too. It’s a bombastic spectacle. The scenes are thrilling, and there are some great moments of suspense. My blood really rushed when Iron Man is flying through the air, explosions surrounding him, even if I didn’t understand why some of the action was occurring. 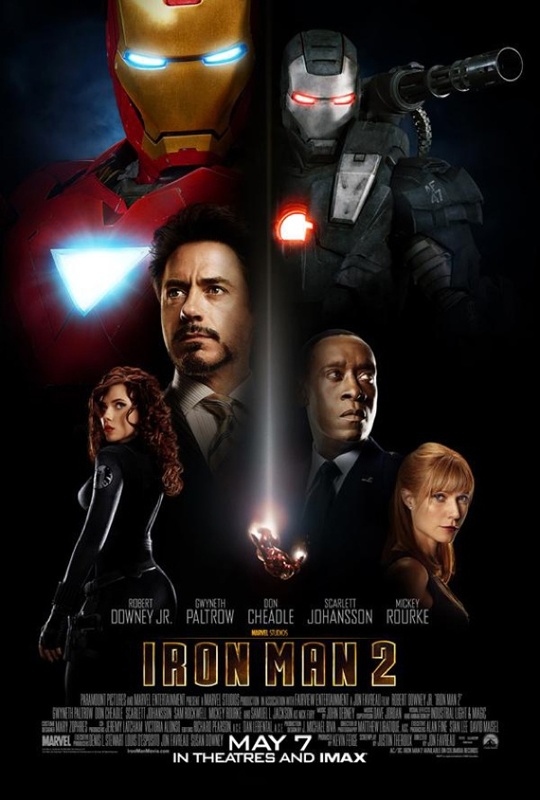 IRON MAN 2 gives a good effort and does its best to keep up with the first film. Unfortunately it doesn’t manage to surpass it. BONUS: Make sure to stay until the end credits are over for an extra scene. Marvel continues to try to set up the upcoming AVENGERS film. Dave White is the author of WHEN ONE MAN DIES and THE EVIL THAT MEN DO. He regularly blogs at Do Some Damage and Dave White’s Writing Block. More than any other series, this one is about weaponry. I find that less interesting than darkness (Batman) or goodness (Superman) or youth (Spiderman). And watching drones fight drones was especially dull. What I did like was two good villains (thought Rockwell especially was swell), some great dialog, two peachy women, the humor, and the incomparable Robert Downey who saves every movie he's in. Also too much setting up The Avengers franchise. Stay in the moment.